Finally, almost at the last possible moment, Premier Clark has called a by-election in Vancouver Mount Pleasant for 2nd February. This riding, previously held by the often-disappointing Jenny Kwan until she resigned last summer, includes Grandview west of Commercial Drive. Melanie Mark has been selected as the NDP’s candidate, with Gavin Dew running for the Liberals, and Pete Fry for the BC Greens. I have worked with Pete Fry for several years on a number of issues, beginning when he was chair of Strathcona Residents (SRA) and I was chair of GWAC. 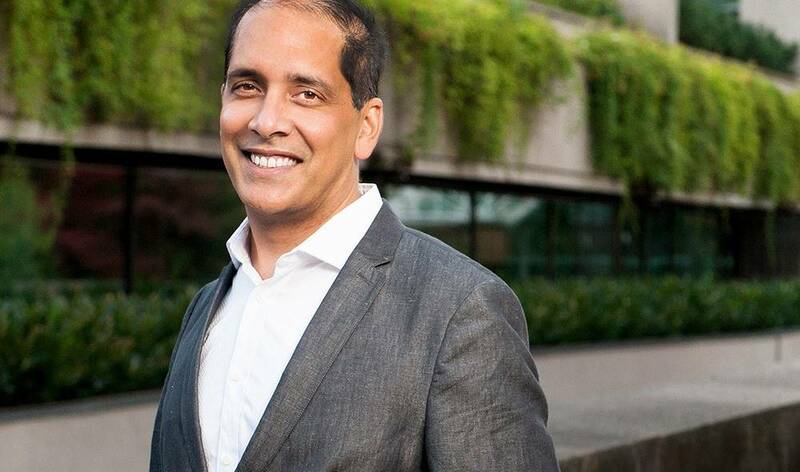 He led SRA into the Coalition of Vancouver Neighbourhoods as a founding member, and he has been pivotal in leading communities in tackling development, viaduct, and housing issues. He will be a vigorous supporter of local options in Victoria and I will be cheering him on in this by-election. Pete Fry is, I believe, the only candidate who actually lives in the riding. We don’t need a parachute NDP-er and we certainly don’t want another BC Liberal. I urge you to give Pete Fry your full support. The proposed sale of public lands at Stamps Place and other BC Housing locations, no doubt including McLean Park in Grandview, has raised the ire of a number of concerned parties, not just the Coalition of Vancouver Neighbourhoods. The OneCity Party issued a statement calling “for a halt to this process,” and supporting “real consultations”. They continued, the “Province and BC Housing are attempting to off-load their social housing properties, responsibilities and all the risk onto non-profits. This has the potential to be a lot of Little Mountains, right across Vancouver,” referencing the recent destruction of social housing in the Little Mountain neighbourhood. This could be a horrible mess, especially for the residents of the properties involved. The Coalition of Vancouver Neighbourhoods is a consortium of 25 Vancouver Residents’ Associations representing residents across the city. As a coalition, our purpose is to ensure that planning and development in our neighbourhoods happens within specific guidelines that focus on meaningful consultation, public engagement and collaborative planning. We are writing to express serious concern with your proposed plan to offer significant public lands and housing throughout the City of Vancouver for sale and potential redevelopment without any prior discussion with impacted neighbourhoods. There is a tendering process currently underway for the first two such properties. Therefore our concerns are immediate and urgent. It is our position that there is no need for haste in selling off BC Housing operated land. On the contrary, there are many reasons to undertake a thorough collaborative planning process with residents and the communities in question, with a focus on local preferences for land ownership and development. We believe that this must happen prior to any decision any one of BC Housing’s holdings. We are alarmed by the speed of this drastic change in policy. While it is understandable that nonprofit housing societies would want to purchase rather than lease the lands on which they operate, it is unclear whether or how the public, or the neighbourhoods, or indeed residents of the housing will benefit from such a change in ownership. Local input is critical to ensure that these properties continue to meet their goals. As such, any plans for use which will bind BC Housing’s ability to deliver services must, in our view, incorporate such input. The tender must be halted to ensure the future viability of these properties. On behalf of the many Vancouver residents we represent we ask that you terminate the current tender, and suspend the policy to allow for a full and open public discussion of the merits and efficacy of undertaking such a change. As taxpayers and residents we share ownership of the properties in question which your government manages on our behalf. We wish to have sufficient time and information to allow for fulsome consultation and collaboration on the future of these public lands. The Coalition’s Statement of Principles and Goals outlines more completely what collaborative planning entails. We attach a copy for your reference. We need to keep these lands in public ownership or – even better — find some way to transform this into a resident-owned and managed situation. Besides that, there was no consultation in this case with the residents or Ray-Cam which currently helps manage the properties. It seems that the BC Government has learned from its buddies at Vision Vancouver that in matters concerning local residents, the latter should be ignored and an autocratic decision should be made from the top. Residents of Grandview need to be particularly concerned becausr McLean Park will no doubt be the next target. This needs to be stopped. As a consistent critic of the current taxi regime in Vancouver, my immediate reaction to hearing that Uber wants to open in our city was applause. However, it seems that Uber is not a good employer. In fact, they appear to be predatory employers with their eye solely on the bottom line. I hope that all current taxi drivers here read “Against Sharing” before signing up. There is clearly major discontent among Uber drivers in many American cities, while the company grows its value like Topsy. Do we really need more bottom-feeding here? Better that the City reduce the current taxi shortage by doubling and tripling the number of legal cabs in Vancouver. I had an interesting morning today, having been invited by a UBC prof to meet with a group of ten “urban planners” from Thailand who were interested in hearing about community engagement. We met at SFU Harbourside, and I brought along Fern Jeffries from the False Creek Residents’ Association. The Thais, it turned out, consisted of four hotel owners from a small resort, along with six local city officials including the Mayor and their senior Planner. They had spent the last few days meeting with Vancouver and Richmond City folks, Translink staff and developers, all of whom had regaled them with the joyous wonders of “Vancouverism ” — high density and even higher towers. Today, Fern and I explained to them the other side of the “Vancouverism” coin — top-down planning that ignores the desires of local residents, and which changes skylines and lifestyles to the benefit of the developers rather than the people. 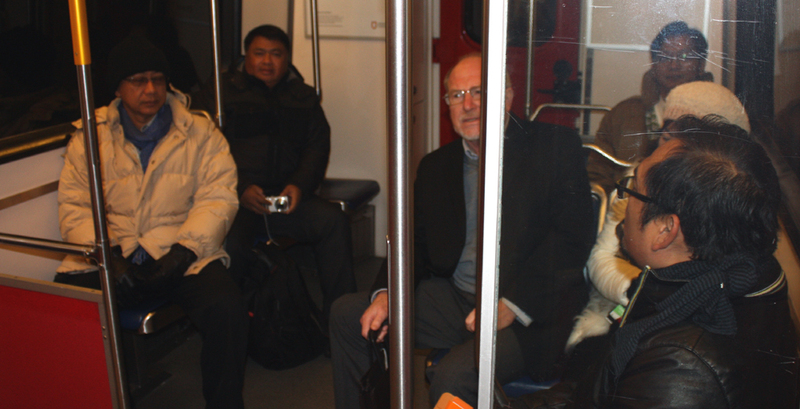 They had visited the station under the auspices of Translink the previous day. I gave them a different view, I am certain. We walked a block or so into E. 10th and I showed them a typical Grandview street of detached houses. I believe they were genuinely shocked that such a beautiful and livable street could be under threat. It was a thoroughly enjoyable time with a very pleasant group. I hope we may have leavened the pro-tower stuff that our City planners and developers would have stuffed them with. 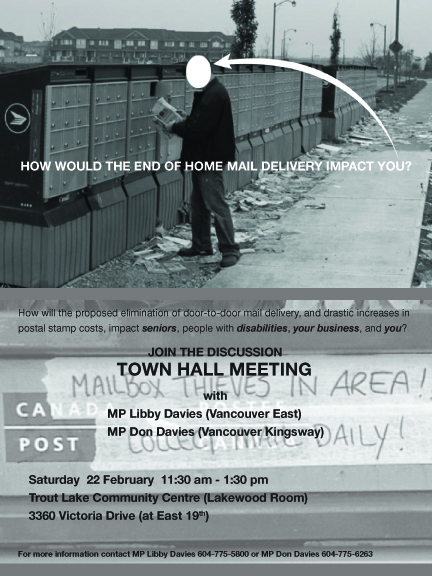 Community Mailboxes: Good or Bad? It is simply a disgrace that Michael Graydon, CEO of the BC Lottery Corporation which regulates gaming in this Province, has suddenly left that position to become CEO of the new Paragon Casino in downtown Vancouver. There are statements all around, from the City and the Province, that this is all legal. It might well be legal, but it sure ain’t right. You are currently browsing the archives for the — Vancouver News category.